Un-freaking-believable (in a great way!). The awesomeness of Cinder cannot be explained by my words. You have to read it to love it! At first, I thought it's probably Cinderella with a twist, which it is. Only it's not so much as just Cinderella but also a bit of Snow White and Beauty & The Beast set in an amazing world. Oh, add some sci-fi to the mix too! Cinder's a mechanic, the best in New Beijing, and also a cyborg. In a dystopian world hit by a plague for which no cure exists yet, cyborgs aren't treated with much respect. 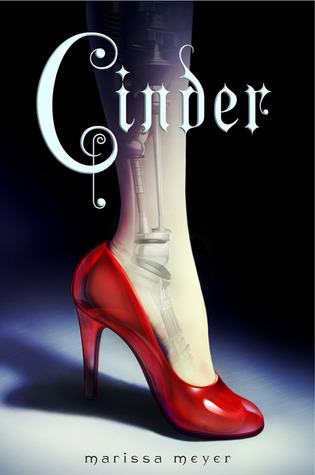 Complete with a swoon-worthy prince, an evil queen and a girl (or in this case, cyborg) who's a surviver , Cinder's the beginning of a modern fairy tale! There's nothing I can tell you about the plot that isn't already mentioned in the blurb without giving you spoilers. All I can say is, Marissa Meyer's debut novel is absolutely FANTASTIC and any YA/Dystopian/Sci-Fi fan would absolutely love this! It had me hooked, that's for sure! The end of the book left me wanting more. Really, I want Lunar Chronicles #2 and I want it now! Argh! I have to wait a WHOLE year! When you finish reading Cinder, you'd feel the same way, believe me, I know. This isn't one to miss. Just buy it. “He was the fantasy of every girl in the country. He was so far out of realm, her world, that she should have stopped thinking about him the second the door had closed. Should stop thinking about him immediately. Should never think about him again, except maybe as a client - and her prince. Great review,I put this book to my read list. I want to read this one too and your enthusiastic review just wetted my appetite even more. Haha yey! I'm reading this right now. I'm loving it so far! I've got about 100 pages to go and I can already tell that it's going to get a spot on my faves shelf! I've been hearing a lot about this book but I hadn't made up my mind whether I would like it or not. I'm still kind of on the fence about it, but I won't rule it out. Thanks for the honest review. on my TBR list!! need t get to it asap!